A great way to grow the newsletter subscriber base is to encourage signups at special events. For example, the upcoming NHCW events in Wichita, McPherson, and Topeka could be opportunities to get more newsletter subscribers. Someone has to transcribe names and email addresses one by one, which adds another potential point of failure to the signup process. Some percentage of subscribers won't make it into the newsletter database because it's impossible to decipher their handwriting. I've made a streamlined version of GraceMed's usual newsletter signup form. You can use the form from any web browser, but this post will show you how to turn it into a web app. This will make the iPad function as a dedicated newsletter signup system. To make it work, grab an iPad (or iPod Touch or iPhone) and follow these steps. On the iPad, open this blog post in the Safari app. Then, tap on this link to open the form. When you're managing a booth, you're juggling a lot of things at once, so it's helpful to simplify as much as possible. You don't want to always want to be carrying around the newsletter signup form. It's nice to be able to leave the iPad on the table in front of you — like you would with a clipboard — but kids love to play around with iPads. NB: Don't forget to turn off the automatic screen sleep function so the iPad is always on and ready to accept the next subscriber. This digital signup form eliminates the need to interpret and transcribe handwriting. Submissions skip the middle man by feeding directly into a dedicated newsletter group for event attendees. Part of the process of onboarding new GraceMed providers is getting their profiles posted to the website. In May, we began using a shared database to support the publishing process. The database has sped things up and given everyone involved a better overview of where we are in the process for any given provider. But one area that could be improved is staff photo acquisition and distribution. Staff photos are used for the website, but they're also used for portraits and ID badges. Multiple people need access to these files and having the photographer email one person creates a bottleneck. As soon as the form is submitted, the files appear in the employee directory database, and the staff member's status in the system is automatically updated to let everyone know that the photos have been received. GraceMed staff who have access to the directory can then download the files at their convenience. “Sessions” are visits to the website within a 30 minute period, whereas “unique visitors” is a better picture of individual traffic. For example, a person who visits five webpages on Monday morning and 3 pages on Wednesday evening generally counts as 1 unique visitor and 2 sessions. More visitors is a good thing, of course. But the goal of the website isn't to have as many visitors as possible. After all, it would be better to have just 100 visitors a month with 20 of them making a donation and 50 making an appointment than getting 10,000 monthly visitors only to receive one donation and five appointments. Most people who visited the website over the past six months have done so only one time. New visitors made up nearly 75% of the total traffic to the website. Prospective patients are getting the info they need to make an appointment in a single visit and have little reason to return. For example, they may make an appointment and then not need a follow-up — or they may make their follow-up appointment before leaving the clinic. Prospective patients are not persuaded to make an appointment in their first visit and aren't returning to the website to reconsider. Do prospective patients usually visit a health care provider's website several times before deciding on a clinic? How many of the website visitors who are looking for a provider are making an appointment on their first visit to the website? I don't know the answer to the first question. But it seems likely that patients looking for a family doctor who can perform regular checkups would search for one primarily based on location and cost, which decreases the likelihood of extensive, comparative research before selecting a provider. As for how many people make an appointment on their first visit — the only way to know is to find out how many people call the phone numbers listed on the website. We can track how many people click on the links to call from cell phones, but that only accounts for visitors who are a) on a cell phone and b) are in the habit of clicking on phone numbers instead of writing them down and then leaving the website to manually dial the number. 53% of visitors are using a mobile device. To get a better understanding of the website's conversion rate for making appointments, it would be best to offer an option to make an appointment through the website. There are ways to offer online appointments that comply with federal privacy regulations. Making appointments online is something we can look at another time, though, if there's an interest in providing patients with that service in the future. About 50% of website visitors are under 35 years of age. 73% of visitors are women. The website's audience skews a bit to the younger side and is predominantly female. What content might encourage more men to visit the website and take next steps? Can we develop the website to better serve the needs of the many women who come to the site? What if GraceMed focused on developing content to help mothers who are looking for vaccination services near them in various locations? Could GraceMed develop content that would rank well in Google searches to reach those individuals? It’s moderately difficult to rank for the phrase “vaccinations near me” on Google at the national level, but the fact that people searching for the phrase in McPherson aren't provided with a map of local providers in the search results suggests there may be an opportunity to rank there. 3.6% of website visitors in Kansas were from McPherson during the first half of this year. However, with the McPherson clinic in place, that number can be expected to rise. Given that a strong percentage of the website's audience is young and female, the data suggests that developing content for young mothers in McPherson could be a worthwhile endeavor. A blog post providing answers to questions related to vaccine schedules for children and insights or quotes from GraceMed providers about the importance of vaccinations should also help search engines identify GraceMed as a local authority on the topic, thereby increasing visibility in local searches. Many more visitors to the website come from web searches than from other channels, like social media. 70% of the people who come to the website find it through a search on the web. The most effective way to consistently reach more people on Facebook is to pay for Facebook advertising. Beyond reaching people on Facebook (i.e., getting more Facebook likes and shares), it would be good to then measure how much Facebook advertising impacts conversion goals. On the other hand, optimizing website content to serve the intent of people searching the web for health care services can boost traffic and increase conversions. Unlike a paid Facebook or Google advertisement, publishing useful content to the GraceMed website can bring in search traffic for long periods, whereas online advertising is relatively ephemeral. Quality website content is also more likely to build trust with members of the community than conventional web advertising, which can positively impact many aspects of an organization. The newsletter is also an effective way to drive traffic and build positive relationships with patients and donors. Unlike a Facebook post, every newsletter sent to a subscriber is guaranteed to be shown to the intended recipient. There is no algorithm preventing people from seeing the content GraceMed shares through its newsletter. GraceMed has sent 6 newsletter campaigns this year. The average open rate was 37%, which is 118% higher than the healthcare industry average. The average click rate was 6.17%, which is 155% higher than the industry average. The newsletter is in its infancy, and we'll have more meaningful data with more campaigns and more subscribers, but it is growing steadily. Future newsletter development will be focused on automation campaigns that target particular segments by subscriber activity. Last month, we set up the first automated responder that welcomes new subscribers and encourages them to make a donation. I think it would be helpful to have a lapsed donor automation campaign in place by the end of the year. This campaign will identify donors who have not made a donation in the past year and automatically send them a personalized appeal for their continued support. First-time visitors to the website land on these pages most frequently. Only 39% of visitors saw the homepage first. Landing pages give some insight into visitors' intent and how website content has been assessed by search engines. Search engines prioritize results based on a variety of criteria, including relevance to the user's intent, content quality, and location data. Why are Mother Mary Anne, Dodge Family Clinic, and Oaklawn Family Clinic such popular landing pages for new visitors? These clinics all show up in the top "local three pack" map in Google search results. The local three pack is that map we saw earlier when searching for vaccinations. Why are those clinics showing up in the local pack? A likely reason is that they all have good reviews. Positive online reviews contribute to Mother Mary Anne's higher web traffic. Clinics with high reviews rank higher in Google search results. Pictured here: Results for a Wichita resident Googling "doctor no insurance". Reviews on Google and other location data providers like Yelp are important because they literally put GraceMed on the map. Good reviews increase visibility in search, and they can have considerable influence on a person's decision to make an appointment at a particular location. Reviews can be seen as a form of low-cost advertising and reputation management. With that in mind, it may be a good idea for GraceMed to develop ways to encourage online reviews from patients and begin to respond to patient reviews — good and bad. There's a lot to be said about how to go about getting more reviews and the best ways to respond to reviews, and it's something we can definitely look at in the future, if there's an interest in that. We've recently begun claiming clinics on Google. The process entails sending a postcard with a code to the location, having an employee at the location relay the code back to GraceMed HQ, and then auditing the listing data. Search engines like Google personalize search results. 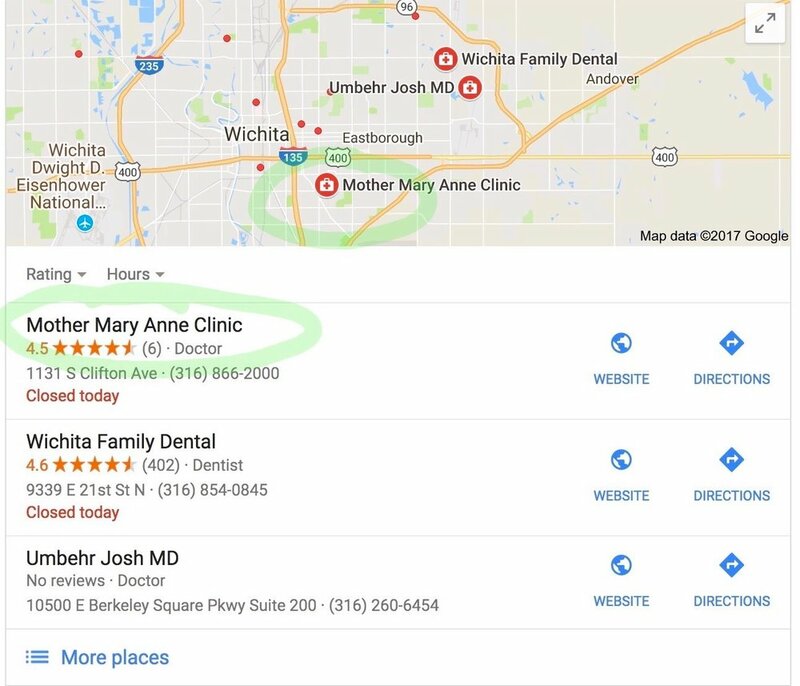 If you search for a term like "clinic no insurance", Google will prioritize results based on your visits to websites like GraceMed, so your results will be different from those of a prospective, new patient who has no such search history. I use a service that lets me search local markets (i.e., Wichita, Topeka, and McPherson) while removing personalized results. This helps simulate the experience of a prospective patient with no such search history located in those respective cities. These searches give us insight into visitors' intent and suggest what content or features people would like to access through the website. In short, what people search for can be seen as an itemized list of how to increase audience satisfaction and decrease frustration. By making the content and functionality people are searching for available online, we can improve the user experience, which increases the number of website visitors, which leads to more data insights … and a virtuous cycle is born. It's worth mentioning that the search topics above overlap with some of the feedback we received from GraceMed customer service representatives in our first survey of CSR's last summer. They identified GraceMed costs and the ability to fill out paperwork for new patients online as commonly requested information or features. This is far from an exhaustive look at the data that can be gleaned from the past 6 months of activity around the website and other communications channels. But this information begins to show how data can be used to inform content and marketing development efforts. I'm a believer in using feedback as a tool for improvement. If you have a moment, please complete the survey below. It's only a couple of questions, and your response will be anonymous unless you choose to identify yourself. If you'd like more immediate answers to specific information, please email me. Thank you! I've made a relational database using Airtable to manage publishing new employees (and more). We're already using this database to manage provider profiles, and I'm inviting the HR team to join us so we can make it even more effective. Some views of the data are better than others, depending on the task at hand. For example, if you want to quickly see who is starting in the next week, you might switch to the Start Date Calendar View. If you update a record in one view, the change will show up across all views. Expand a record to view the changes that collaborators have made. Here you can also add comments and @ mention team members to ask questions or notify them of important changes. This intro scratches the surface of what we can do with this database and how to use it. I'd be happy to get on a call or screen share to introduce the system in greater depth. HR folks — you have invitations to this private database. I'm sure you'll have suggestions as to how it can be improved. Please share your feedback!